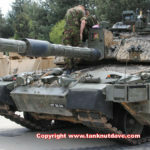 The British Challenger 2 Tank is the current Main Battle Tank of both the British Army and Royal Army of Oman. 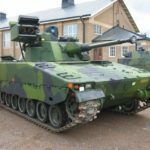 Serving the British Army since 1998, it is the most heavily armored tank in the world and equipped with the 120mm rifled L30 main gun. 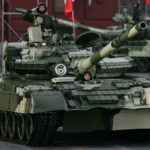 It has been deployed to Kosovo as part of KFOR and Operation Telic 1, which is better known as the 2003 Invasion of Iraq. It remained in Iraq until 2009 during which time it received a number of armor upgrades, referred to as DL2 “Dorchester Level 2”. In 1986 ROF Leeds and the Challenger production line were acquired by Vickers Defence Systems, which later became Alvis Vickers and is now known as BAE Systems Land. 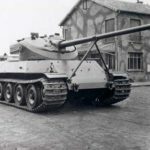 Vickers Defence Systems submitted a design, which was a modified Challenger hull, but only 5% of the components of the new design were compatible with the Challenger, as the new design had over 150 modifications including a brand new turret. A £90 million fixed-price contract to undertake a demonstration phase was awarded, which was to last until the end of September 1990. 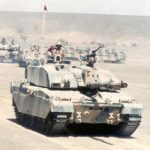 By August 1989, work started on building the nine prototypes, which were to also demonstrate that both a depleted uranium projectile and a new charge system could be developed for the Royal Ordnance 120mm CHARM gun. 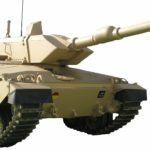 The VDS new design was chosen as the British Armies new MBT and replacement for their Chieftain Main Battle Tank fleet, designated the Challenger 2 FV4034. 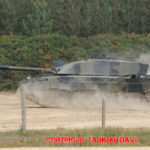 VDS were awarded the contract worth £520 million to produce 140 tanks In June 1991, which included 13 training vehicles. Their production started in 1993 and the first delivery’s to the British Army were made on the 16th of May 1994. 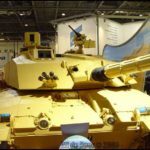 The original idea by the British Ministry Of Defence of having a mixture of both Challenger 1 and 2 was dropped and VDS received a further order in July 1994 to build an additional 259 Challenger 2. 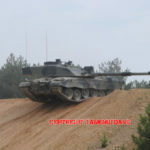 The Challenger 2 AKA “CR2” entered service in 1998 with the Royal Scots Dragoon Guards in Germany. 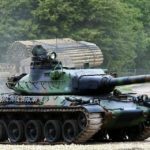 The Challenger 2 is built of a specialist steel called Sheffield Steel, which is known as a crucible steel. This is a process used to remove impurities found in other steels, resulting in a superior quality. 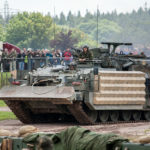 The Challenger 2 uses the latest version of Chobham armour, which is referred to as Dorchester, the name of the town in the UK where the armour is manufactured. 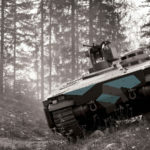 Though many countries use composite armour, it is the bonding process and the matrix with which the composition (hence term composite) of ceramic materials is held in, that makes the Chobham series of armour so unique and effective. Dorchester armor covers the frontal arc of the hull and turret. 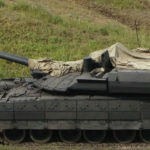 An un-deployed Challenger 2 simply has its base Dorchester armour covering its hull and turret fronts. 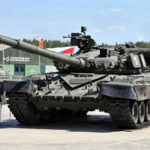 These are simply known as MBT’s or in the driver training world “Gun-tanks”. 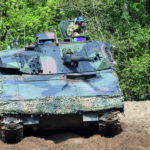 They are used through out the British Royal Armoured Corps for training and exercises, in Germany, Poland, Canada and the UK. DL2 A: This was issued on Telic 1 (2003 invasion of Iraq) which had an nose cone with ERA mounted on the hull front. A thin backing board is attached to the hull sides. 8 modules are attached with a final plate with large circles on it. The modules have composite armor. DL2 B: The same backing board on the hull sides, with the same modules with composite inside and the numbers increased to 10, replacing the final plate. The side of the turret are fitted with 4 modules containing composite. 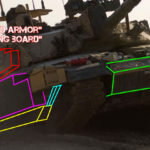 DL2 C: This was either or both the added bar armor around the rear of the hull plus turret and the large module on the hull front, which contains composite. It retained the same backing board. DL2 D: A new backing board. This board was thicker and armored giving additional protection from spall etc. It also has an attached armored spaced module along the bottom. This is flush with the DL2 B hull modules. 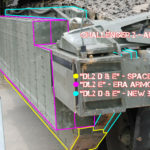 DL2 E: Retained the DL2B modules on the side of the turret, DL2 C front module, cage armor and both the backing board and spaced armor. The DL2 B hull modules are replaced with double layered ERA blocks. You can see that they stick out past the DL2 D spaced armor. They were added to defeat shaped charged IED daisy chain attacks and mean they can defeat tandem charged ATGM. 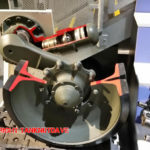 DL2 F: Not yet issued, they are ERA blocks mounted on the DL2 B turret side modules. 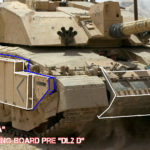 They are represented in terms of weight by metal plates on the DTU Challenger 2 “Megatron”. 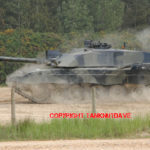 The Challenger 2 Main Armament is the L30, which is manufactured by BAE Systems Land Systems (formerly RO Defence). The L30 is rifled, giving the CR2 greater accuracy, as the rifling imparts a spin to the fired round which stabilizes it and prevents it from tumbling, as well as giving the CR2 the ability to fire heavier rounds. 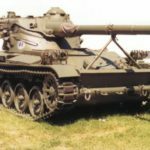 The 120mm L30 cannon is made from Electro Slag Re-melting steel (ESR) to lengthen the cannons life and increase its accuracy. To quote one British CR2 crewman ” Thanks to the quality of the L30, the old issue of wearing down of the rifling through repeated firing is almost non-existent. On average we fire 450+ rounds a year on active vehicles during training exercises and we averaged 200 during Operation Telic 1. In all my years of service, I’ve never known an L30 to be replaced due to wearing of the rifling “. He went on to say ” The L30’s rifled barrel is more than capable of firing and withstanding the ammunition required during a normal conventional operations training year and has done since 1998. When the recommended rates of fire are adhered to and the correct maintenance and service of the weapon system is carried out, the barrel has no disadvantage over that of a smoothbore “. To initiate the firing sequence in the L30 CHARM3 120mm gun all 3 parts of ammunition must be in place, firstly the Projectile is loaded, followed by a bag charge of tightly wrapped cordite strips. Then the breach is closed and a Vent Tube is automatically loaded inside a special chamber within the breach blocks. When the firing switch is pressed a small electrical charge is sent to the back of the vent tube and it is fired. The Vent tube blasts a jet of fire through a special guide in the breach blocks and into the chamber via a small hole. this is then channelled into the back of the Bag charge which has a small built-in bag of fine powder in its base. Upon firing and recoil the empty Vent tube is ejected out the back of the breach and is caught by a cloth shield. Another Vent tube is then automatically loaded. and the loading sequence can begin once more. 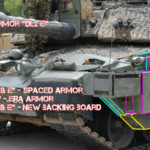 Thou some may class the vehicle as using a three-part ammo, the Vent Tubes are loaded into the breach in a magazine, so are not manually loaded with the projectile and charge by the operator during each loading sequence, therefore we still refer to the Challenger 2 as using 2 part ammo. 1. Armour Piercing Fin-Stabilised Discarding Sabot (APFSDS for short) is the L27 CHARM3 and has a DU tip to avoid “mushrooming” on contact with the enemy armour. Tankies call this round “FIN”. The L14 propellant system is based on a rigid Combustible Case Charges (CCC for short) and loaded after the FIN. 2. 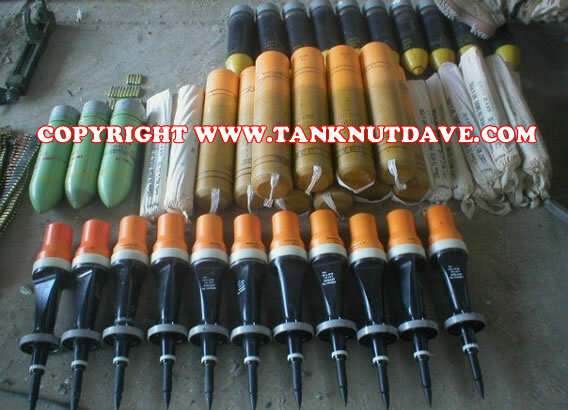 High Explosive Squash Head (HESH for short) is a multi-functional round. When it impacts on a wall/armour, the explosive spreads on to the outer surface, known as a “pat” and then is detonated, which sends a shockwave through the armour blowing off an inner section known as a “Spalding”, which is the size of a plate and fly’s around the turret cooking off the ammo, cutting hydraulics and carving the crew up. The blast can also damage the sights, sensors, tracks and main gun inflicting either a firepower kill or mobility kill. It’s extremely effective as a demolition round and anti-personnel. Its armed by the rifling of the L30 and requires a low m/v to form the pat, so is fired at a high trajectory to gain range using the L3A3 cordite stick charge. 3. White Phosphorous is used for Covering Withdrawals, Covering enemy positions and used as a Marker for Target/obstacle recognition. The L34 is the same size and weight as a HESH round and three are carried on a typical bomb load unless a specific reason is pre defined. 1. DS/T (Discarding Sabot Training) DST to the crew. It is made of Tungsten and cheaper than the L27 CHARM3. 3. There is no White Phosphorous training round. A bomb load is made up of 33 FIN, 3 Smoke and 13 HESH. In a Sabre Troop the Troop leader can redistribute the HESH or Smoke about his 3 Tank Callsigns. 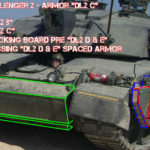 Or choose to carry more HESH on his Tank (The Centre Callsign) This is called being “HESH Heavy” giving the Troop Corporal on his left and Troop Sergeant on his right more KE rounds ,as they are more likely to engage enemy tanks first. For close encounters, the Challenger 2 is equipped with a co-axial Boeing 7.62mm chain gun, which is located to the left of the main gun. The loader has a 7.62mm GPMG L37A2 anti-air machine gun, mounted on the cupola. 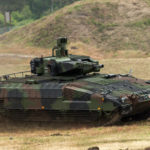 The Challenger 2 was trialled with the Rheinmetall 120mm calibre Length 55 smoothbore main gun as used on the German Leopard 2A6 Tank. 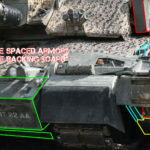 Whilst testing was successful, the Challenger 2 storage system for 2 part ammunition proved incompatible with smoothbore ammunition, which is 1 part. 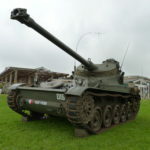 Though BAE Systems conducted works to modify the storage, only 6 120mm smoothbore rounds could be fitted and the conversion to a smoothbore main gun was dropped by the Army. The digital fire control computer is supplied by Computing Devices Company (now General Dynamics – Canada). Both the Gunner and Commander have Primary Sights. They can both either switch between their day channels (magnification x4 and x10) or the channel from the Thermal Imaging Sight, which is called the “Thermal Imaging Sensor Head”. It has a magnification x4 and x11.5 and is also displayed on TV monitors AKA a display module. There is a display module at both the commanders and gunners station next to their PS’s. The 4Hz laser rangefinder (range 200m to 10km) can be operated on either channel through the PS or display module. All sights are gyro stabilised. The commander’s cupola is equipped with eight periscopes which provide him with a 360° vision to check around the vehicle. The Gunner has a x1 magnification periscope so that he can traverse the turret and elevate the main gun whilst the vehicle is on the move and not engaging targets. The CR2’s Hydrogas suspension gives it an increased stability for whilst firing on the move. The CR2’s 1200bhp is generated by a Perkins CV12 26 litre diesel engine. The gearbox is a David Brown TN54 epicyclical transmission with 6 forward and 2 reverse gears. It has a 450km on road and 250km cross-country capability. 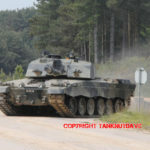 Many publications claim the Challenger 2 has a top road speed of 59km/h, however this only a requirement. The engine is electronically governed to 3200 RPM and that in 6th gear is it capable of 70km/h (road speed and cross-country) thanks to its Hydropneumatic suspension AKA Hydrogas. It uses a nitrogen springing medium, which is approximately six times more flexible than conventional steel as used in TorsionBar suspension. This allows the CR2 to maintain a relatively high-speed as the nitrogen springing easily absorbs irregularities in the terrain it crosses in comparison to TorsionBar. 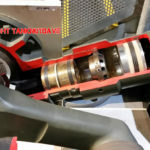 The TA (Track adjuster) is a hydraulically extended wheel on an Exocentric axle fixed to a ram operated by the driver. This allows him to adjust the tightness of the track and avoid any unnecessary stress on the William Cook Defence double-pinned tracks. It also increases the ease and maintenance of the tracks to get them off. 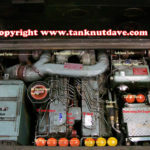 The Challenger 2 original engine management system was called the DASCU (Digital Automotive System Control Unit) and was later changed to the VICS (Vehicle Integrated Control Unit) which came with the Bowman tactical, digital communications system. 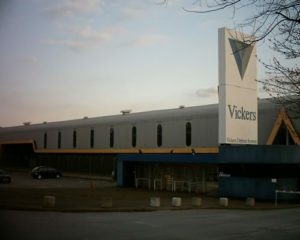 VICS allows the crew to disable all safety systems of the engine allowing it to drive in NBC contaminated environments. It was also discovered that the engines output providing an additional 10km/h road speed. The main complaint about the CR2 was its lack of secure modern digital communications. 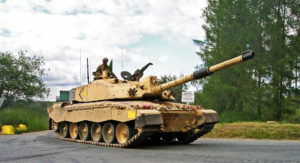 This has been resolved through out 2006 with the introduction of the Bowman tactical, digital communications system with a built-in GPS receiver, which paved the way for the Challenger 2 to be fitted and integrated into the BOWMAN, with the Platform Battlefield Information System Application (PBISA) from General Dynamics UK. 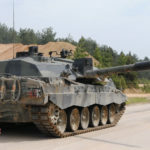 It operates a program called Combat, which displays a digital battlefield map known as “Situational Awareness” displaying the other Challenger 2/British Army AFV’s thanks to the new BOWMAN’s GPS receiver, which also provides live updates as the AFV’s are on the move. 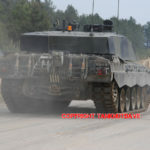 The system integrates the commander’s display, inertial navigation system, digitization processing computer and driver’s display panel, giving the commander and crew exceptional Situational Awareness and allows other British Army AFV’s to send E-mails between each other and send instant Contact Reports back to HQ. The system also allows the commander to point at a spot on the digital map and send a go to order to the drivers display, which shows him an arrow and range to that spot, as well as the best route. Deployed as part of the Kosovo Force (KFOR), which was a NATO-led multinational peacekeeping force which was responsible for establishing a secure environment in Kosovo. It provided fire support for UN security forces apart from one throwing a track and crashing through some poor families house it had a relatively quiet tour. Also known as “Operation Swift Sword II” it was a major military exercise in September and October 2001 in Oman. 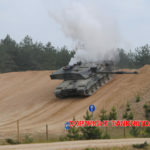 The 66 Challenger 2’s which contributed to the exercise suffered from poor reliability. This was not due to any inherent defect with the tank, but rather due to the failure of the Army to adequately ‘desertise’ the tanks. Lessons learnt led to some modifications to the 120 Challenger 2’s deployed to secure the South of Iraq, notably Basra during Telic 1. 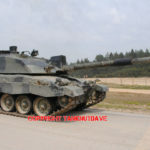 The real test for the Challenger 2 tank came in Operation Telic 1, which is better known as the 2003 Invasion of Iraq. 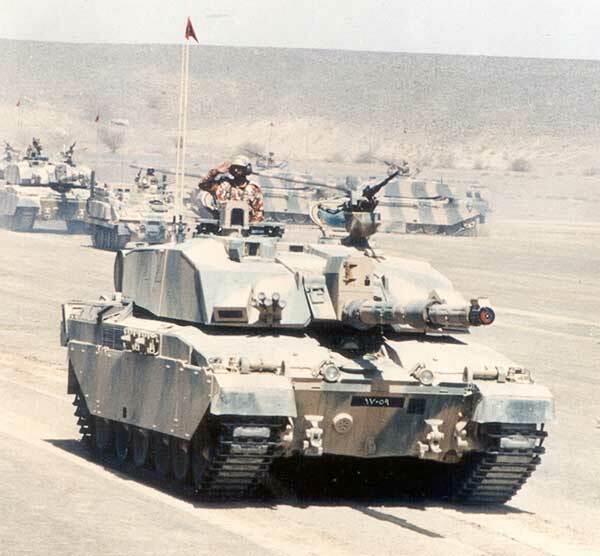 During Telic 1 the Challenger 2 did not see as many tank on tank engagements as the Challenger 1 had during the Gulf War of 1991. Many of the Tank on Tank battles were abandoned Iraqi tanks, including the famous 14 on 14 documented tank battle. However it was used to spearhead all the assaults and raids into Basrah, noticeably Al Zubiah, to open up the south for the remaining British Forces. 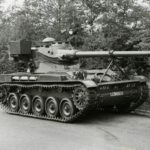 Telic 1 Challenger 2 history was best known for a Royal Scots Dragoon Guards tank throwing its tracks and getting stuck in a ditch, which was reportedly hit by 14 RPG variants and a MILAN anti-tank missile. The attack saw the sights on the vehicle destroyed, but the armour was un-penetrated and the crew walked away when the vehicle was recovered. The term “blue on blue” refers to Fratricide, or an accidental attack on friendly forces. On the 25th of March one Challenger 2 engaged another Challenger with HESH rounds. HESH is a typical high explosive lobed round meaning its firing trajectory is a high arch making it at range a top attack weapon. 1 round hit the back decks of the tank injuring the crew and another hitting the top of the turret reporting with an open commanders hatch. This vicious explosion and enormous heat cooked off the tanks ammunition consequently destroying the tank. tragically killing two crewman. This engagement remains the only Challenger 2 to be catastrophically killed on operations. 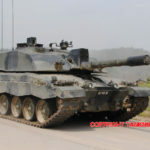 After Telic 1, the number of Challenger 2’s in theatre were reduced and moved to more of a security role rather than an aggressive war fighter. Often providing an armoured fist when striking into the city, as well as leading most convoys and providing a physical deterrent. It was during this period in August 2006 that a Challenger 2 from the Queens Royal Hussars was struck by a deadly tandem charged RPG-29 anti-tank missile. Though there were various inaccurate reports on the web at the time, the missile dropped short, exploding on the ground sending shrapnel and blast up under the tank penetrating the then unprotected steel belly of the tank, The Driver; Trooper Sean Chance, lost three of his toes in that attack. In April 2007 whilst on a security patrol in Basra, a Challenger 2 of the 2nd Royal Tank Regiment hit an Improvised Explosive device, this was a EFP = Explosively formed projectile designed to form a molten jet of copper capable of penetrating through a lot of armour. This attack again was a belly attack. The driver, Trooper Stephen Shine bore the brunt of the blast as it tore through the floor of his drivers cab. The lower section of his left leg was damaged so badly doctors were forced to amputate above the knee. Steve still serves in the 2nd Royal Tank Regiment and was later deployed on Operation Herrick (Afghanistan). He also skies for the British Army Team. The Challenger 2 remained in Iraq until roughly 2009. For a number of years it operated at Squadron strength, which is just 14 vehicles. Many claim that as there were less Challenger 2’s than the US Abrams series deployed to Iraq, the Abrams would therefore take greater losses. 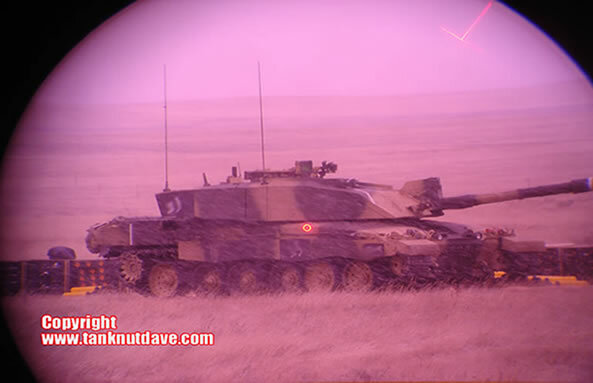 After the invasion and during the “occupation” or Iraq, 14 Challenger 2’s and the CRARRV were out working almost every night and therefore were in greater demand than their Abrams cousin, which meant these Challenger 2 were still attacked regularly. Sadly 5% of the Abrams deployed were returned to the US as either heavily damaged or destroyed during this period. 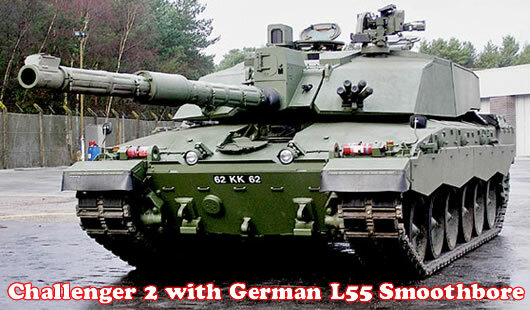 The Challenger 2 had no losses, despite being attacked every night by the same enemy, with the same weapons. To say that British Forces did not receive the same intense level of attack, though on a smaller scale, is seen by British Forces as an insult. 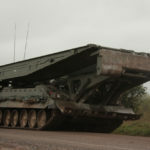 The Combat Support vehicles based on the Challenger 2 have been deployed to Operation Herrick (Afghanistan) such as the CRARRV TROJAN and TITAN Armoured Vehicle Launch Bridge during the 2010 Operation Moshtarak. 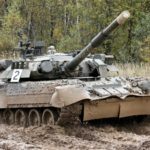 Oman – 38 Challenger 2 tank, x4 Challenger Armoured Repair and Recovery Vehicles and two driver training tanks purchased in July 1993 and November 1997 valued at £280 million. UK – 399 Challenger 2 tank (including 4 driver training tanks) were originally bought by the British Army. 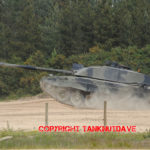 The Strategic Defence and Security Review of 2010 suggested that the armies Challenger 2 fleet should be dramatically reduced to 130. However this was not implemented. 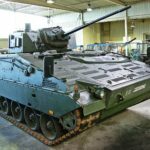 The British Army still operate some 225+ Challenger 2, all in various states of readiness due to a lack of spare parts (several have been cannibalized or scraped). The British Army are looking to rectify this through the LEP program. The British Army also operates 33 Titan AVLB and 33 Trojan.